Take an Advent break and choose from more than 200 city hotels of all standards. No reservation fees. 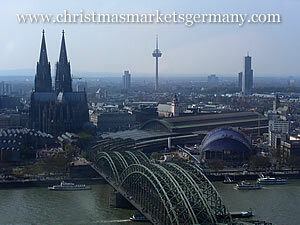 Cologne has a variety of Christmas markets, as befits its status as the fourth largest city in Germany. Originally, what became known as Advent or Christmas Markets were month-long markets that sold toys, nuts and sweets. Cologne was relatively late on the scene, with the first in the city being the Nicolaimarkt in 1820 in the old town. Sixtyfive years later, the mass of stands and the rowdiness of the market had grown too much for the authorities and the market was banned. The current markets on the Neumarkt and the Alter Markt were founded in the 1970s, with the cathedral market opening in the 1990s and most of the other smaller markets since the turn of the century. The biggest of all the city markets in the shadow of the symbol of the city, Cologne Cathedral. This market is located in the Cologne's 'Altstadt' (the old town) on the Alter Markt and calls itself the Home of the Heinzelmännchen (who were little creatures from a Cologne legend who used to do all the housework until they were annoyed by an inquisitive housewife). The Angels' Market is the big market in the Neumarkt square, a little way outside the immediate city centre. 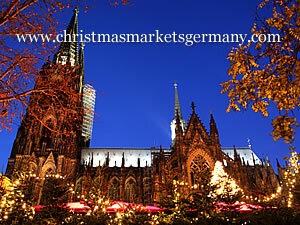 It is one of the original markets that restarted the Christmas market boom in Cologne in the 70s. The Stadtgarten is one of the parks on the edge of Cologne city centre and this Christmas market is held in the beer garden of the main restaurant in the park. The relatively-new Hafen Weihnachtsmarkt is on the banks of the Rhine in the grounds of the Chocolate Museum. The "Nicholas Village" is a Christmas market in the Rudolfplatz square with good public transport connections. Location: To the west of the city centre near the inner ring road. See Cologne Cathedral (of course). A World Heritage recognised site, the symbol of the city, and a treasure trove of history and architecture for those interested in those topics. The current building was started in the 13th century and eventually finished six centuries later. It was damaged in the Second World War, although the two spires never fell. Visit one of the towers for an aerial view over the city. It may not be the highest, but some of the best views come from the Köln Triangle - the tower across the river from the cathedral. There is an observation deck at the top of the tower. Visit one of Cologne's big sports teams. Although Cologne appears to be one of those big cities whose sports teams don't live up to the importance of the city, the home stadia and level of competition is worth experiencing. FC Köln seem to be constantly flirting with relegation from the top football league (or celebrating promotion to it, if the flirtation went wrong in previous years). And the ice hockey team, the Kölner Haie, were one of the top teams in the league in years gone by but have recently fallen on harder times. However they still attract some of the largest crowds in the European sport. The closest airport to Cologne is Köln-Bonn Airport (also known as Konrad Adenauer Airport) which is located about 15km to the southeast of the city. The regional rail link (the S-Bahn) has regular services into the main Cologne railway station (located next to the cathedral). As well as InterCity and regional rail links, Cologne also has an extensive local rail system called the Stadtbahn. It is frequently called the U-Bahn (underground railway) even though the vast majority of it is above ground and some of the lines resemble tram services.